Lagos State House of Assembly has queried what it describes as the ‘worrisome silence’ of President Muhammadu Buhari over the rift between the national chairman of the All Progressives Congress (APC), Chief John Odigie-Oyegun and Asiwaju Bola Ahmed Tinubu. Leadership of the Assembly made their stance known at yesterday’s plenary while insisting that Tinubu’s political influence can never be whittled down by anybody. This development is coming in the wake of the public spat between Oyegun and Tinubu over the outcome of the APC governorship primary in Ondo State, where Tinubu’s favoured candidate, Segun Abraham failed to secure the party’s ticket. 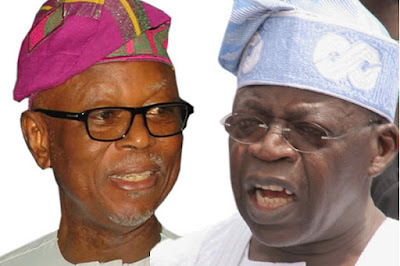 Thereafter, Tinubu told Oyegun to resign and accused him of subverting the wishes of the party members in Ondo. Speaking under “Matter of Public Importance,” Chairman of the House Committee on Information and Strategy, Tunde Braimoh expressed worry over Buhari’s ‘silence,’ especially given the “years of sacrifice and financial commitments” Tinubu had made for the emergence of the APC. Braimoh and other APC lawmakers said it was an insult to Tinubu, given the leadership role he (Tinubu) played in the unification of the Yoruba nation. “The entire situation does not augur well for the internal democracy of our party, and efforts must be put in place by all stakeholders to arrive at a quick resolution. Therefore, to achieve this, we call on the leadership of APC to ensure that adequate respect and honour is given to the leaders of the party, including Tinubu,” he said. In his submission, the Speaker of the Assembly, Mudashiru Obasa, said that rather than being seen as apathetic to the crisis, President Buhari should play the role of a father to unite everybody in the party. “The signs coming from the presidency is not good enough. Federal appointments had been made without Tinubu’s knowledge, and major decisions had been taken without adequate consideration for his opinion. We believe this is not good enough and it is a sign of disrespect for a personality like Tinubu whose contributions to the consumation of APC in Nigeria can never be brushed aside,” Obasa said.